The ear, nose, and throat surgeons at ENT & Allergy Center of Austin were the first in the area to offer patients the convenience and efficiency of in-office balloon sinuplasty. This minimally invasive sinus surgery involves the use of a small, flexible catheter to open blocked sinus passageways. The surgeon guides the catheter through the nasal cavity and nostrils to the area of blockage. Once in place, a small balloon is inflated to gently widen the sinus cavity walls without causing damage to the area. Your physician will then deflate and remove the balloon and flush the sinus cavity, all without having to cut into any tissue or bone in the area. Safe and Effective. All surgeries involve some risk, but clinical research has shown balloon sinuplasty to be safe and effective in relieving sinusitis symptoms in adults and children. Minimally Invasive. By using small, flexible devices that enter the sinuses via a patient's nostrils, balloon sinuplasty involves no cutting of body tissue or bone removal. Reduced Bleeding. There is less bleeding involved in a balloon sinuplasty due to its being a minimally invasive technique involving no cutting through tissue or bone. Speedier Recovery. In most cases, patients who have a balloon sinuplasty can return to their normal activities within 24 hours. Does Not Limit Treatment Options. Use of this minimally invasive endoscopic treatment can be used in conjunction with other therapies and does not limit future treatment options. 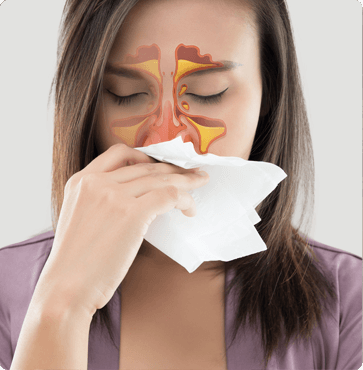 Balloon sinuplasty is a popular treatment for sinusitis in adults as well as children. Watch the videos below to learn more about this innovative, minimally invasive procedure. To gain initial sinus access, a sinus guide catheter is introduced into the nasal cavity to target the sinus ostia (opening that connects a sinus to the nasal cavity) under endoscopic visualization. A sinus guide wire or a sinus illumination system is introduced through the sinus guide catheter and gently advanced into the target sinus. The sinus balloon catheter is then deflated and removed, leaving the ostium open. The sinus is irrigated, flushing tenacious sinus contents like pus and mucus. The irrigation catheter is removed, leaving the sinus cleared of mucus and allowing the return of sinus drainage. There is little to no disruption to mucosal lining. Talk with the ear, nose, and throat surgeons at ENT & Allergy Center of Austin about your condition and whether a balloon sinuplasty is right for you. Call (512) 328-7722 or request an appointment online. You can visit us at one of our central Texas offices in Westlake, Cedar Park, or Round Rock.